In Hockey, The U.S. Is Right. Why Is Canada Left? Attentive Olympic spectators may notice that most Canadian hockey players shoot left-handed, while U.S. players tend to shoot from the right. How did that happen? 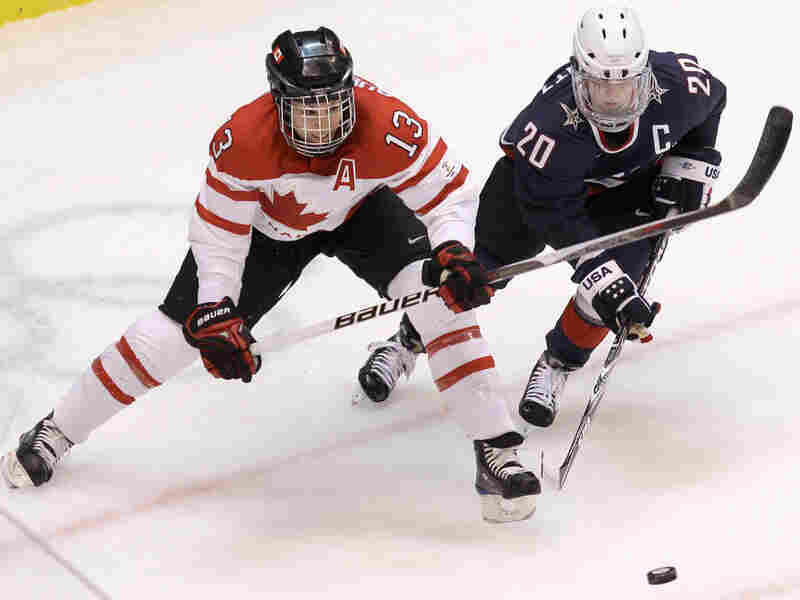 Canada's Caroline Ouellette (left) and USA's Natalie Darwitz chase the puck during the gold medal game at the Vancouver 2010 Olympics. Attentive Olympic spectators may notice that most Canadian hockey players shoot left-handed, while U.S. players tend to shoot from the right. Why? One theory says it's because Canadians play hockey like of a bunch of 3-year-olds — when they're 3 years old. In a country devoted to the sport, that's about the age Canadians first take up the stick — a much younger start than Americans. Tots that young are more likely to use their stronger hand to control the shot, which puts their right hand at the top of the stick — and makes right-handed kids into lefty shooters. American kids are Johnnys-come-lately to the ice, and they and their eager hockey moms and dads are accustomed to swinging baseball bats — with their left hand at the bottom. Turn that same positioning upside down on a hockey stick, and voila — left hand at the top, right-handed shooter. So if more Canadians shoot left-handed, shouldn't their hockey supply stores sell more lefty sticks than right? "But we don't," Chad Purdy, manager of the Hockey Shop in Surrey, British Columbia, tells NPR's Scott Simon. He's got a theory of his own about why he sells more right-handed sticks in a nation of left-handed shooters. "If you're naturally a right-handed shot, that would put your right hand on the bottom of the shaft, where you're putting all the force," he says. "Maybe these right-handed shooters are breaking more sticks."